Tuesday, 11 September 2018, 1:12p.m. Pink has realised the dream of Whangārei artist Jessie Rose by signing an artwork created to raise money for a children's charity. Rose created the massive glittering painting and placed it on Trade Me, with a call for Pink to sign it while on her New Zealand tour. When the artwork is sold, the money raised will go to KidsCanNz, a charity that works with underprivileged children. Rose videoed the creative process which took place near the Te Matau a Pohe bridge in Whangārei in near darkness. The painting took 20 minutes to complete, with a clear glue being strategically painted on to a black board. The painting comes to life when glitter is thrown at the board, the silver glitter appears and Pink's outline magically appears. "It is no secret that Pink loves children and supports similar charities and it is my dream to have her sign it," Rose said. 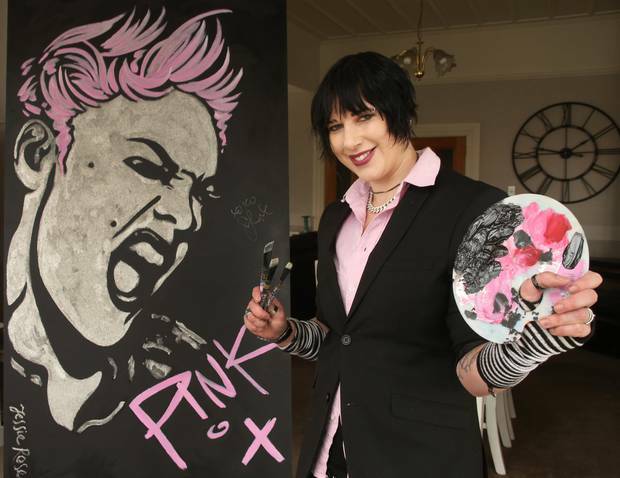 The video was viewed 66,000 times and shared more than 1000 times with an appeal for Pink to autograph the painting. Just 24 hours before her Auckland opening performance on Saturday, Rose was notified Pink would sign the 2.4m high x 1.2 metre wide painting. "All Saturday, we were trying to get it sorted and get it to Auckland. We weren't prepared." Eventually, her contacts at Morris and Morris Funeral home offered the use of a ute. With some careful wrapping and a tarpaulin the painting plus a second one were carefully taken to Auckland. After negotiating the security checks, Rose delivered the painting backstage at Spark Arena. While Rose didn't get to meet Pink, the paintings were both signed when they were collected after the show. The rock star had signed "Pink xoxo". Rose got to enjoy the show in the VIP seating near the stage and only four seats away from Pink's father. The painting is safely back in Whangārei and even before it was officially announced the work had been signed, the top bid was $1600. The auction is scheduled to finish later this week. It's not the first time Rose has painted a famous singer - in 2016 a painting she did of Adele fetched almost $1000 for KidsCan. 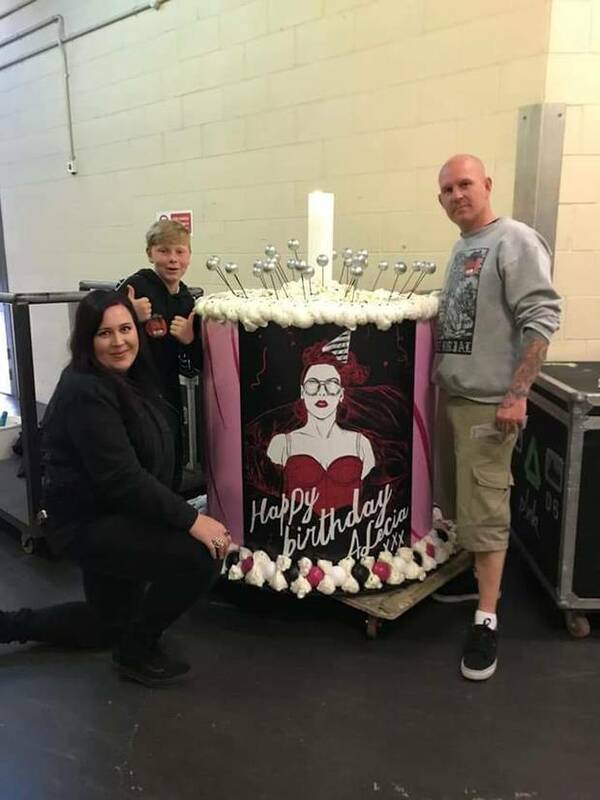 Meanwhile, another Northland connection to the concert was the surprise birthday cake presented to Pink during the concert. Ruakākā's Rhys Owen and his 13-year-old son Connor along with Auckland friend Ami Holifield created the cake with ingredients including polystyrene, bamboo skewers, plywood, expanding foam, glitter and confetti. Owen got the nod from a friend late on Wednesday and by 1pm on Saturday he had the metre-high cake delivered. The creation took place in a Papakura shed after a rough sketch was done on a napkin. Owen is experienced at making props for major film companies and was involved in the Hobbit. The $1800 cake was wheeled out on stage much to Pink's surprise during the show. The crowd had already sung her happy birthday so a guitarist played the song for her. Owen and his son were issued with worker's passes allowing them to wander around the venue including going backstage. "It was like a massive circus, theatre and concert in one. It was definitely a high level performance," he said.